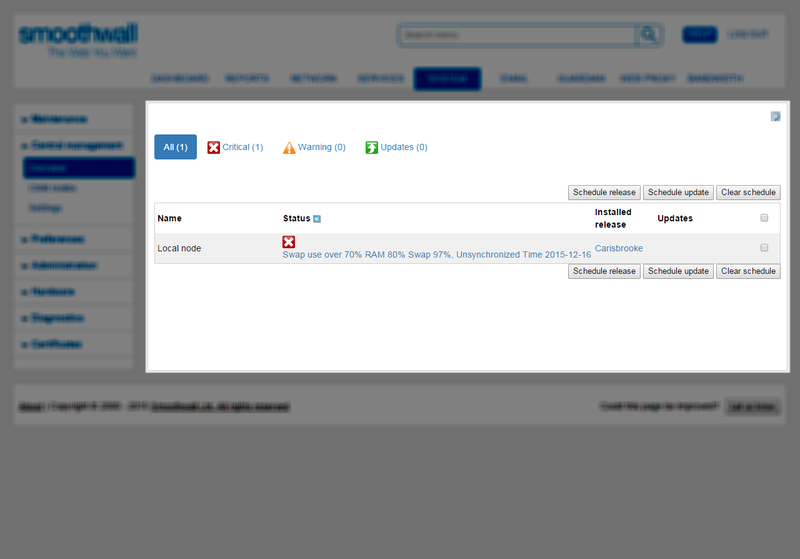 From the Overview page you can monitor the status of nodes, and update the software when needed. You can view the status of all nodes from the parent node's central management Overview page.  On the parent node, go to the System > Central management > Overview page. The parent node displays current node status.  Name — Provides the name of the node. Click on the name to log in to the node.  Status — The Status field displays the current state of the node. • OK — The node is functioning and does not require attention. • Critical — The node requires immediate attention. Click on the node’s status field for more information. • Warning – The node does not require immediate attention but should be checked for problems.  Installed release — Provides the name of the installed release for that node. Click the release name to view the log details for that node.  Updates — If any updates are available for the installed release, click the provided link to go the Schedule page. 1. On the parent node, go to the System > Central management > Overview page. 2. Click the Updates tab. 3. Locate the relevant child node, and click the Status text of the node. You are taken to the Node details page. 4. Click the Updates header to view the updates available. 5. To apply the updates to the node, click Schedule update. • Now — Select to apply the updates to the node immediately. • Later — From the drop-down list, select when you want the updates applied to the node. 7. Click Schedule update. The updates are applied to the node as specified in the previous step and the node is rebooted. All scheduled update and release installations, and reboots are canceled. When required, you can reboot a child node from the parent node. 2. Click on the Status text for the node you want to reboot. • Now — Select to reboot the node immediately. • Later — From the drop-down list, select when you want to reboot the node. 4. Click Schedule reboot. The node is rebooted.